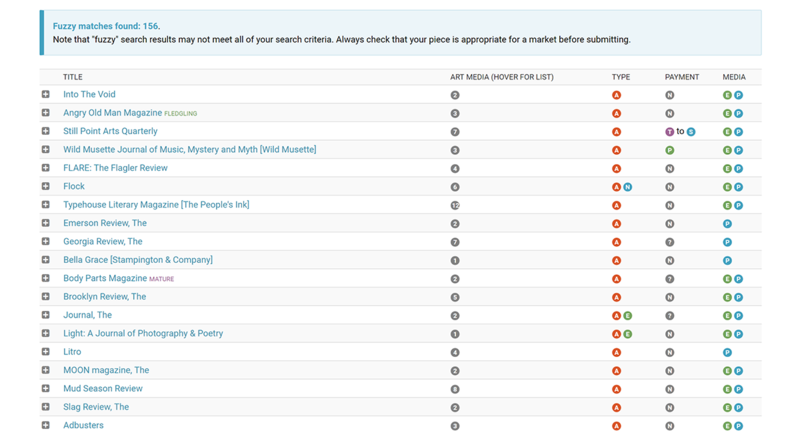 Note: On the publisher search page, first make sure you are searching for visual-art publishers. If not, use the "Switch to" drop-down list at the top of the search page to select Visual Art. Not all visual art markets list their visual art media preferences. You may want to try the search both with and without Visual Art Medium selected, or try changing the Search Level to "Fuzzy" or "Broad". Not all visual art markets list their visual art style preferences. You may want to try the search both with and without Visual Art Style selected, or try changing the Search Level to "Fuzzy" or "Broad". The options here are fairly self-explanatory. "Graphic Narrative" and "Photo Essays" are the two specialty options. Everything else is covered by "Artwork." If you're not sure what to use, we recommend starting with "Artwork." This option does not apply to "Artwork." However, it does apply to the other Types. Using this option will exclude markets that don't specify what page/image limits they're looking for, but there's no harm in starting with those markets that we know accept pieces of a certain length. If you do use this option, be sure to also select a Type/Length option. If you get too few results, try changing the search level to Fuzzy or Broad. Enter the medium of the piece you are submitting: Audio, Image, Text, or Video. In most cases, Visual Art submissions will be Submission Medium: Image. However, if the piece exists in a different medium, you can try that option, too. Important: The Sort By options marked with asterisks (*) will also eliminate any listings with fewer than 10 visual art submissions reported to us in the past 12 months. If you want to ensure you see all matching listings, avoid using those options. While this is a fun search option, you should be aware that using it will eliminate any markets with fewer than 10 visual art submissions reported to us.